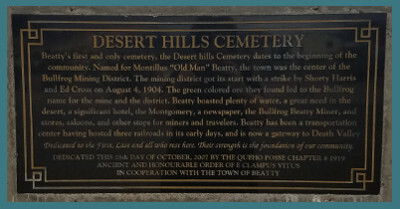 Beatty's first and only cemetery, the Desert Hills Cemetery dates back to the beginning of the community. 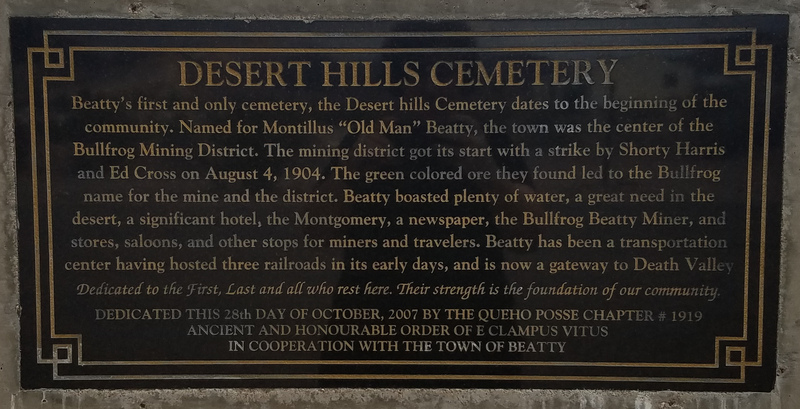 Named for Montillus "Old Man" Beatty, the town was the center of the Bullfrog Mining District. The mining district got its start with a strike bt Shorty Harris and Ed Cross on August 4, 1904. The green colored ore they found led to the Bullfrog name for the mine and the district. Beatty boasted plenty of water, a great need in the deset, a significant hotel, the Montgomery, a newspaper, the Bullfrog Beatty Miner, and stores, saloons, and other stops for miners and travelers. Beatty has been a transportation center having hosted three railroads in its eary days, and is now a gateway to Death Valley.